Today I took part in Run To The Beat at Wembley Park, a musical 10k. These sort of fun runs have become big business in the last few years (I've also done The Color Run twice, and The Electric Run), but this was my first 10k, which definitely felt a tad more 'proper' than my previous 5K runs. I find it really hard to eat or drink before running, so I ate a big meal last night, but nothing this morning. I had a coffee once I woke up, but other than that I find an empty stomach works for me. Make-up wise, I don't wear foundation, or eyebrows when running, but I do still wear some eyeshadow, eyeliner, mascara and a smidge of blush. I find when running a length like 10k, the first quarter is fine, the second quarter is pretty hard (mentally rather than physically), the third quarter is fine again, and then the final quarter is hard physically. There were times I was sure I was going to have walk for a bit, or stop, but I just focused on one more step, then another, then just one more. There were quite a lot of hills on this route, and running up them all was definitely a challenge, perhaps more in the mind than in the legs, but definitely physically too. I also hurt my shoulder running round which was a bit of a nagging bother. 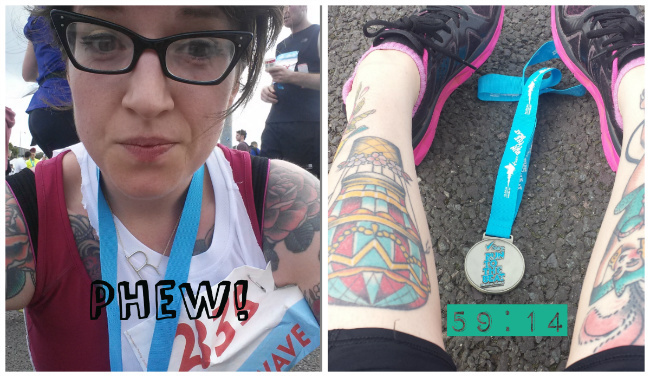 I did manage a final sprint at the end, but definitely just wanted to lie down and not get up for a little while! The first 5K I ran I swore never again, and then did 2 more, before signing up for this 10k. Again I definitely thought "Never again" as I ran the final 3k, but who knows. Never say never hey? !